The Global Positioning System, also called NavStar, that we use was built by the US military and has been fully operational since 1995. Many modern GPS receivers use a combination of both GPS and the Russian GLONASS satellites for improved coverage and accuracy. The GPS system currently has 31 active satellites in orbits inclined 55 degrees to the equator. The satellites orbit about 20,000km from the earth's surface and make two orbits per day. The orbits are designed so that there are always 6 satellites in view, from most places on the earth. GPS uses a lot of complex technology, but the concept is simple. The GPS receiver gets a signal from each GPS satellite. The satellites transmit the exact time the signals are sent. By subtracting the time the signal was transmitted from the time it was received, the GPS can tell how far it is from each satellite. 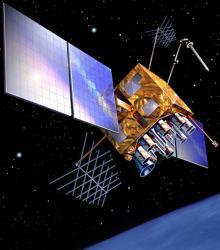 The GPS receiver also knows the exact position in the sky of the satellites, at the moment they sent their signals. So given the travel time of the GPS signals from three satellites and their exact position in the sky, the GPS receiver can determine your position in three dimensions - east, north and altitude. There is a complication. To calculate the time the GPS signals took to arrive, the GPS receiver needs to know the time very accurately. The GPS satellites have atomic clocks that keep very precise time, but it's not feasible to equip a GPS receiver with an atomic clock. However, if the GPS receiver uses the signal from a fourth satellite it can solve an equation that lets it determine the exact time, without needing an atomic clock. If the GPS receiver is only able to get signals from 3 satellites, you can still get your position, but it will be less accurate. As we noted above, the GPS receiver needs 4 satellites to work out your position in 3-dimensions. If only 3 satellites are available, the GPS receiver can get an approximate position by making the assumption that you are at mean sea level. If you really are at mean sea level, the position will be reasonably accurate. However if you are in the mountains, the 2-D fix could be hundreds of metres off. A modern GPS receiver will typically track all of the available satellites simultaneously, but only a selection of them will be used to calculate your position. To determine the location of the GPS satellites two types of data are required by the GPS receiver: the almanac and the ephemeris. This data is continuously transmitted by the GPS satellites and your GPS receiver collects and stores this data. The almanac contains information about the status of the satellites and approximate orbital information. The GPS receiver uses the almanac to calculate which satellites are currently visible. The almanac is not accurate enough to let the GPS receiver get a fix. If the GPS receiver is new, or has not been used for some time, it may need 15 minutes or so to receive a current almanac. In older GPS receivers, an almanac is required to acquire the satellites, but many newer models are able to acquire the satellites without waiting for the almanac. To get a fix, your GPS receiver requires additional data for each satellite, called the ephemeris. This data gives very precise information about the orbit of each satellite. Your GPS receiver can use the ephemeris data to calculate the location of a satellite to with a metre or two. The ephemeris is updated every 2 hours and is usually valid for 4 hours. If your GPS receiver has been off for a while, it may take up to several minutes to receive the ephemeris data from each satellite, before it can get a fix. Your GPS will have a screen, like the one on the right, which shows which satellites are in use. The bar graphs show the strength of the satellites that the GPS has acquired. If the bar is hollow, the GPS is still downloading the ephemeris. The circular plot shows the location of the satellites in the sky - the centre of the circle is overhead. When you switch the GPS on, the time-to-first-fix varies depending on how long it is since you last used the GPS. To get a fix, the GPS receiver needs a valid almanac, initial location, time, and ephemeris data. The terms "cold/warm/hot start" indicate how many of these pieces of data the GPS receiver already has. The terms mean different things to different GPS manufacturers. Cold start - if the GPS not been used for a long time and/or has moved several hundred kilometres it will take some time to get the first fix. In this state, the GPS receiver does not have a current almanac, ephemeris, initial position or time. Older GPS units may take up to an hour to search for satellites, download the almanac and ephemeris data and obtain an initial position, though newer GPS units may require much less than this. If the GPS receiver has moved several hundred kilometres, its assumptions about which satellites to use will be incorrect and it will have to search for them. Most units will let you enter an approximate location to speed the process. Warm start - current almanac, initial position, and time are all valid. Ephemeris data is either invalid or only partially valid. Time-to-first-fix is likely to be 30 seconds to 2 minutes depending on satellite availability and the type of GPS receiver. Hot start - if the receiver has been off for, say, less than an hour time-to-first-fix will likely be 5-20 seconds. What does this all mean in practice? If the GPS has been recently used you should get a fix almost immediately. If it hasn't, put the GPS outside with a clear view of the sky and have a cup of tea. If you have a GPS in a vehicle, it's better to wait for the unit to get a fix before driving off. Receiving ephemeris data for a satellite takes 30 seconds. If you momentarily interrupt the signal during that time the GPS it could take up to a minute more to get the ephemeris for that satellite as it has to start over. If you drive in an area with tall buildings or other obstructions it may take a long time to get the ephemeris data, for four satellites, that is needed for the first fix. The accuracy of the position your GPS reports is influenced by a number of factors, such as the positions of the satellites in the sky, atmospheric effects, satellite clock errors and ephemeris errors etc. 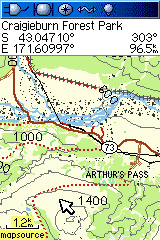 GPS units often show on the screen an accuracy figure, e.g. EPE on Garmin units. Under ideal conditions, this may be 5, or even 3 metres. Manufacturers are vague on exactly how this figure is determined and it would be unwise to take this figure literally. You'll get a more realistic figure by looking in the specification section of your GPS receiver's user-manual. Typically, with a handheld GPS, 95% of horizontal GPS positions will be within 10 metres of their true location. The error in altitude will probably be at least twice the horizontal error. The accuracy of a GPS can be improved by using secondary data from external reference stations. Many consumer GPS units have a WAAS option. WAAS uses a network of ground-based reference stations. Readings from the reference stations are used to correct for some of the sources of error mentioned above. The correction data is sent to geostationary WAAS satellites which transmit them back to WAAS-enabled GPS receivers to improve position accuracy. WAAS is not available in New Zealand. Differential Global Positioning System (DGPS) is a similar system. The data from ground reference stations is transmitted to the GPS using longwave radio, FM radio, or even cellphones. How many satellites are needed for a fix? Have you noticed how cellphone GPS units get a fix almost immediately. They use Assisted GPS (A-GPS) as a way of improving the time to first fix, or even allowing a fix in conditions where the GPS might not otherwise be able to function. The A-GPS device will use a data connection (e.g. 3G on a cellphone) to contact an assistance server. The server can supply almanac and ephemeris data so the GPS doesn't have to wait to receive them from the satellites. The server can also send an approximate location derived from cellphone towers, allowing an immediate fix. In some cases the A-GPS device may send incomplete GPS data to the server for processing into a fix. Once you are out cellphone and WiFi coverage, a cellphone GPS unit has to rely on the satellites to provide the ephemeris & almanac date so, like a standard recreational GPS, it takes 1-2mins to get a fix from a cold start. Copyright © 2009-2014 Integrated Mapping Ltd. All Rights Reserved. This article may not be reproduced without permission. MapToaster Topo/NZ was developed in Christchurch by Integrated Mapping The company, which was established in 1992, has considerable expertise in building mapping and GIS solutions and is 100% New Zealand owned.